Server-side synchronization is the preferred option for organizations with users who run Microsoft Dynamics 365 in a web browser or on a mobile device, such as a tablet or smartphone. Server-side synchronization provides direct Microsoft Dynamics 365-to-email server synchronization. When you use Exchange, this includes bi-directional synchronization of email, contacts, tasks, and appointments. The data synchronized for each user can be controlled by using synchronization filters that are available from the Synchronization tab in the Microsoft Dynamics 365 user options dialog. If you use a POP3 email server, the data that is synchronized includes email only. 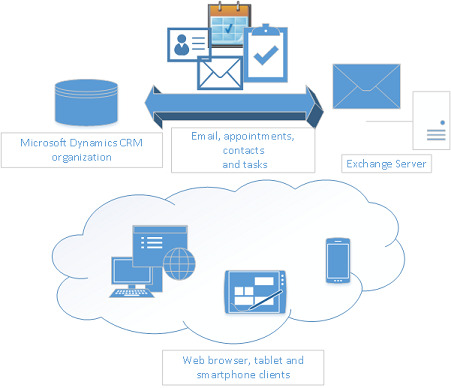 Using server-side synchronization makes messaging data available to a web browser, tablet, or smartphone that is running Microsoft Dynamics 365. For more information about server-side synchronization, see Set up server-side synchronization of email, appointments, contacts, and tasks. A Microsoft Dynamics 365 user can only map to a single Exchange or POP3 mailbox. Similarly, an Exchange or POP3 mailbox can only be mapped to a single Microsoft Dynamics 365 user. When Microsoft Dynamics 365 detects that an Exchange or POP3 mailbox has already been mapped to a Microsoft Dynamics 365 user, a dialog box is displayed to present a choice to the user whether to map the Microsoft Dynamics 365 user to the Exchange mailbox. When the user selects yes, it breaks the previous Microsoft Dynamics 365 user to Exchange mailbox mapping and subsequently the synchronization that would occur between the Microsoft Dynamics 365 user and the Exchange mailbox. When synchronization by using server-side synchronization occurs, the process is dynamic and unique for each user’s mailbox. The synchronization algorithm ensures that mailboxes are synced according to dynamic parameters such as the number of email messages and the activity within the mailbox. Normally, email synchronization occurs every 5 minutes. When a mailbox has many email messages, the interval can be reduced dynamically to 2 minutes. If the mailbox is less active, the interval can be increased up to 12 minutes. Generally speaking, you can assume that a mailbox will be synced at least once every 12 minutes. Note that you can’t manually synchronize records through server-side synchronization and when you track email (Track button), this occurs immediately. Email folder tracking. You can simply drag email to a folder to track it. Folder tracking works on any mobile device that supports Microsoft Exchange, which means you can track email from just about any device. Doesn’t require Outlook. You don’t have to have the Dynamics 365 for Outlook add-in open to synchronize records. You can still use Dynamics 365 for Outlook to track records manually even if you do the synchronization through server-side sync. This also helps to boost the performance of the Outlook add-in. Support for Dynamics 365 App for Outlook. You can track incoming email with the new Dynamics 365 App for Outlook. Dynamics 365 App for Outlook works with Outlook on the web. So all you need is a browser to track incoming email. Efficient resource utilization. Server-side synchronization provides integrated mailbox management. You can disable inactive mailboxes that have permanent errors. It prevents resource hogging by applying an upper limit on the allocated capacity and time-out requests. Connection throttling. Server-side synchronization provides a way to control the number of parallel connections opened against an email server to prevent overloading the mail server. Data migration. Server-side synchronization supports migrating configuration data from Email Router to server-side synchronization by using the migration wizard. More information: Migrate settings from the Email Router to server-side synchronization, Merge email server profiles for migration. Service isolation. Server-side synchronization has separate queue-management and configuration settings for asynchronous operations, outgoing activities, and mailboxes. It is based off asynchronous service architecture and may share the same process. In all cases, it manages server resources while maintaining isolation with the asynchronous service. Error reporting for users and administrators. Server-side synchronization supports logging and reporting of errors specific to an email or one or more mailboxes. More information: Error logging for server-side synchronization. In Microsoft Dynamics 365, you can synchronize emails using Dynamics 365 for Outlook or server-side synchronization. If server-side synchronization is selected, the synchronization does not require running Dynamics 365 for Outlook. You will, however, still need Dynamics 365 for Outlook to promote an item from Outlook. Performance counters. Performance counters are added to Activity and mailbox queue for Asynchronous service and server-side synchronization. **Server role deployment. **Server-side synchronization leverages the Asynchronous Service server role on the Microsoft Dynamics 365 server.